You can’t buy a new Renault in the United States, but Nissan, Infiniti, Mercedes-Benz and Smart brand models are available. Nissan (Nissan and Infiniti) and Daimler (Mercedes-Benz and Smart) each have a strong presence in North America on their own. Nevertheless, the two competitors are moving forward with an alliance that will produce new models for the Infiniti and Mercedes-Benz marques by means of a manufacturing plant currently under construction in Aguascalientes, Mexico. Leaders of the COMPAS consortium are overseeing the Mexican alliance. In 2010, Daimler and Renault-Nissan forged an alliance —COMPAS (Cooperation Manufacturing Plant Aguascalientes) — in an effort to build all-new, next generation compact models for the Mercedes-Benz and Infiniti brands. This week, the 50:50 joint venture was officially launched, with Daimler and Nissan each contributing $500 million to build a $1 billion manufacturing plant. That plant will be constructed alongside an existing Nissan facility in Aguascalientes. The new manufactory is expected to come on line in 2017 and employ as many as 3,600 people directly by 2020 with room to grow as needed. The first Infiniti-based model will roll out in 2017 followed by the first Mercedes-Benz model in 2018. Neither manufacturer has specified what models will be produced, but an Infiniti Q20 or Q30 model is reportedly in the offing. Mercedes-Benz may utilize the facility to begin producing its next generation CLA-Class model line. COMPAS is overseen by a six-member board composed of three members from each manufacturer. 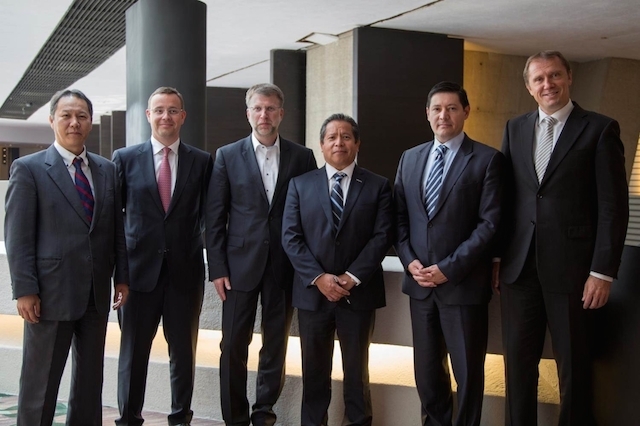 Armando Avila, Manufacturing VP, Nissan Mexico; Carlos Servin, Finance VP, Nissan North America; and Takehiro Terai, Total Customer Satisfaction VP, Nissan North America, are representing Nissan’s interests. Daimler is represented by Michael Göbel, Head of Production Compact Cars, Mercedes-Benz Cars; Axel Harries, Head of Quality Management, Mercedes-Benz Cars; and Christian Schulz, Head of Controlling, Mercedes-Benz Cars Operations. Although the two manufacturers will build new models based on the same platform, each brand will inscribe their unique countenance on the vehicles sporting their names. The bones may be similar, but everything else about these models will be different. Mexico is not the only facility that will build the new models. The companies will collaborate elsewhere, harnessing plants in Europe and China as well. The Renault-Nissan and Daimler partnership falls short of a full-blown alliance whereby each manufacturer takes a share in the other. Nevertheless, it demonstrates that automotive manufacturers can forge confederations to accomplish specific tasks. With both sides contributing to the alliance, development and production costs are shared, leading to greater economies of scale. US sales for Nissan are up 4.2 percent through June and are up by 8.3 percent for Infiniti. Mercedes-Benz sales are up 9.4 percent year to date, but Smart sales are down 22 percent. However, the 2016 Smart ForTwo is all new, arrives this fall, and should help bolster Daimler’s niche A-segment brand. Sales for the entire US market are up 4.4 percent through June 2015 and are on pace to top 17 million units. Softening demand for cars comes as consumers snap up utility vehicles and pickup trucks in greater numbers. Photo copyright Renault-Nissan alliance. All rights reserved.